Drape it like it’s hot…… that is all the noise for 2017. Our clients are scouring Pintrest for the latest and greatest in event backdrops. Drape is used in ceremonies as well as backdrops behind the head tables for the event receptions. In large events spaces, you can use draping to create vignettes for private lounge areas or set an atmosphere for a theme or intimacy. Doorway draping can create a lush factor to an entrance or a tunnel entryway to personalize your event. 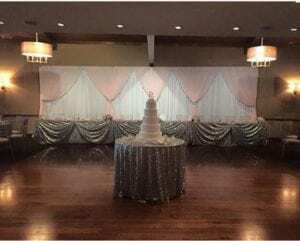 We are seeing draping in many different applications this year in weddings. We continue to add chiffon as table linens, onto table tops and on backs of chairs but it is HOT for Drape. The color selection is endless and the drape factor of the lightweight chiffon allows us to create a custom and timeless look for your event. Draping can help to design and define tunnels, entryways, doorways and other spaces to create dramatic effects in your event space. Draping is a cost effective way to compliment, accentuate or transform a room. Ballroom decor doesn’t coordinate with your wedding decor? Drape the perimeter of the room to hide the walls, wallpaper or decor. 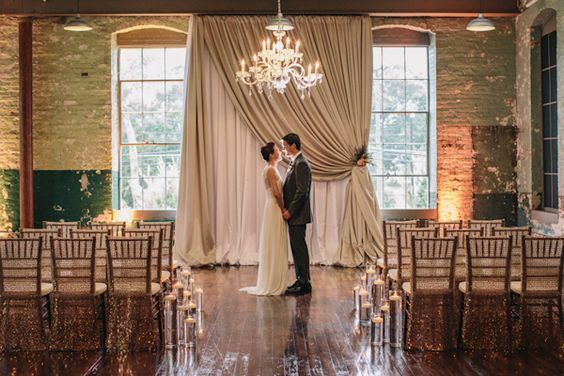 Having your ceremony in the same room as your reception? Create a wall of drape that can separate the two spaces. 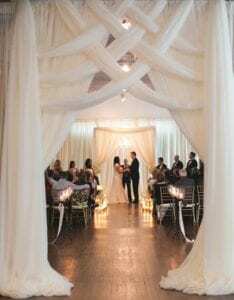 Once the ceremony has ended, tie back the drape to create a doorway/entryway into your reception area. Have a large dance floor that seems too open? Use drape to define the perimeter of the dance floor and create a more intimate space for cutting a rug. Has your guest count dropped and now you have more space to work with? Use drape and lounge seating to make a space for guests to hang out and chat. Whatever the reason may be, draping can help to create a mood, define a space or compliment your head table. Check out our Pintrest Page at https://www.pinterest.com/luxeeventlinen/draping/ to see inspiration images as well as images performed by the Luxe Event Team.